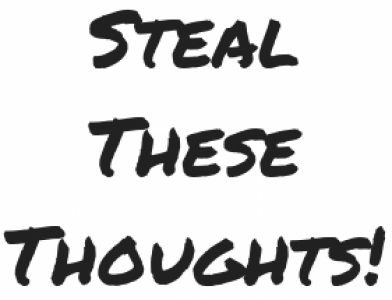 No one ever talks about what we can do – Steal These Thoughts! Sad really isn’t it, 99% of the population will tell you what you can’t do. Rarely do we ever challenge that narrative and talk about what we can do. It’s quite common in conversations that people will focus on what can’t be done or achieved, rather than allowing themselves to consider what could we do? It’s a simple mindset shift really and one you can challenge other people on too. So think about it, what’s the harm in letting yourself think about what you could do? what could we possibly achieve? I’m not saying that you shouldn’t be a realist, but maybe, just maybe your outlook can change if you thought about what you could be capable of doing. The mind is the most powerful tool we have and if you allow it to run riot on the negative playlist of “oh I can’t do that” then it will be more than happy to binge on this. Consider how many people have been told they could not do something, yet they have gone on to prove that claim wrong and done so much more. The internet is littered with stories of people being told they’ll never be able to do X and saying screw that, I’ll prove you wrong. So try not to take life for granted, listen and believe in your own authentic voice, if you believe you can do it, then get out there and do it. If that’s not enough to get you you fired up and challenging the status quo of talking about what you can do, then let the motivational knowledge bombs of Shia Lebeouf help you. Thoughts on lifestyle design, challenging the norm and doing stuff that make you happy. Maybe you’d also like to find out why old does not mean dead and new does not mean best.